Burke resident Maureen Roche told FABB that she loves to ride. She finds that getting out on her bike just makes her feel better. Maureen also told us that she likes to ride because of the freedom it gives her and because she regularly meets new people while out on her bike. In response to our question about where she rides, Maureen told us that she usually rides on the W&OD Trail and along Rt. 123 for trips to Occoquan. 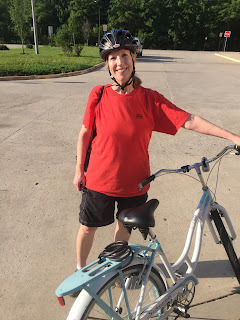 Before heading off to finish her ride, Maureen mentioned that she also values biking because when she and others ride it helps reduce local traffic congestion by taking at least a few cars off the road.